Please view the following announcments from our community. 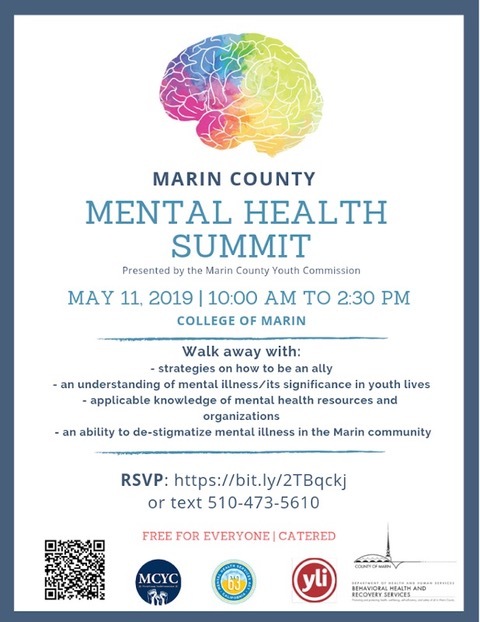 MENTAL HEALTH SUMMIT Presented by the Marin County Youth Commission. May 11 at 10 a.m. to 2:30 p.m. at the College of Marin. Register here or view our flyer for more information. GIRL SCOUTS INFORMATION SESSIONS Interested in learning more about the Girl Scouts for your preschooler through second grader? Please join us for a parent information session on Monday May 6 at Bacich (two times are available: 1-3pm in the Quad or 630pm in the library). The Girl Scouts is a volunteer-run organization that imparts girls of all ages with leadership skills, strong social connections, and a foundation in nature skills, the arts, and science and technology. Neil Cummins has many active troops and many involved parents who can be a support as your explore the opportunities available in the Girl Scouts! Please view our flyer for more information, or contact Molly Schmidt, [email protected] . WARRIORS BASKETBALL CAMP Register now for the Warriors Basketball Camp for Spring or Summer. Please view the flyer for more information or visit the website: warriors.com/camps . CYBERMATH ACADEMY Two locations for Summer 2019 at Stanford and Harvard. ​​​​​​​​​​​​​​​New customers get $15 off ​with the code NC2019 and if 20 new customers join the fundraiser, our school also gets a $500 fundraising bonus. You must use the code NC2019 on your first order to count as a new customer. New accounts to the same household will not be counted.